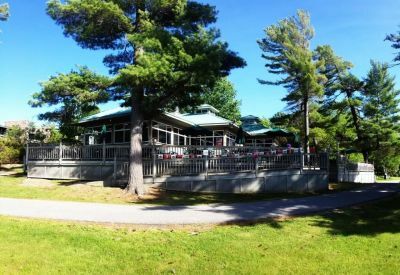 Located right on Georgian Bay in Muskoka with a beautiful lakeside view from the patio, The Narrows Grill can be accessed both by boat and on-foot. Those who are familiar with the Honey Harbour area will recognize that The Narrows Grill is located in what used to be the Mackinaw restaurant at Delawana Resort. Enjoy an affordable and delicious Muskoka dinner by the water or watch the sunrise during breakfast. If you access by boat, The Narrows Grill offers free boat docking at the Delawana docks for visitors of the restaurant. Delawana Resort docks are located on the Inner Channel (aka The Narrows). The docks can be found on the West side of Delawana Resort property, located right in Honey Harbour. Those visiting the restaurant by land can find ample parking at Delawana Resort (look for the resort's reception parking), and reach the restaurant from there by foot on the West side of the resort property; just follow the signs through the resort! To plan your next visit to The Narrows Grill, visit their website at http://thenarrowsgrill.ca for more info.